Important: Prior to creating your competition, please ensure you have completed the Pre-Competition Setup steps. 1. 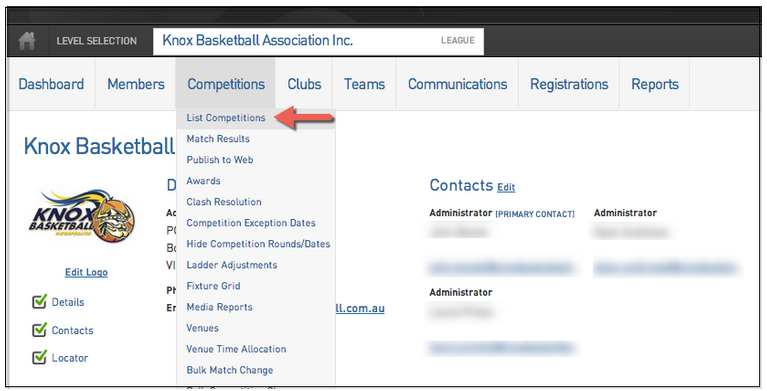 Hover the cursor over the Competitions tab and select List Competitions. 2. A list of your current competitions will appear. Click on New in the top right corner. Further information on Competition Types can be found via our Competition Types article. After selecting your competition format, you will see the 'Add New Competition' screen. This screen is the same regardless of the type of competition format you have chosen in Step 3. Default Game Start Time - Important: this is not to be set at 12:00AM. Time required for Venue - Time of use of Venue (or field) for one match e.g. Playing time + Half Time + new match changeover time = 60. % Of Venue Required - the percentage of field space required to run a game. E.g. 50% will allow you to run two games on one Venue (field) at a time. 5. Once you have entered all the information and settings for your competition, click on Update Competition. So long as all compulsory fields have been completed, a message will appear noting that the new competition has been successfully created. Note: If any compulsory fields have not been completed, you will be automatically taken to the fields that need filling in. The field will appear in red with the message 'Field required' next to it. Enter the information and click on Update Competition to complete the setup of your competition.